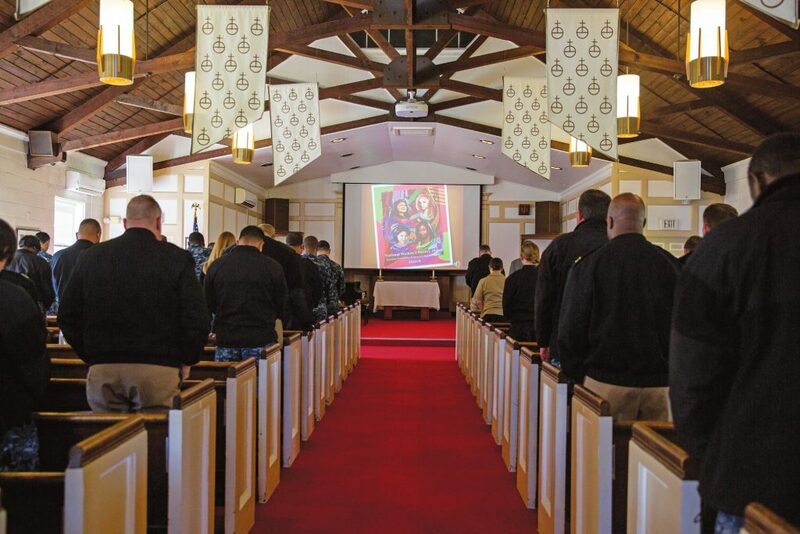 The Command Religious Program supports the command mission by fostering spiritual readiness for military personnel and their family members assigned to the Norfolk area. Chaplains’ ministries are aimed at providing hope and encouragement born of spirituality and faith, through ministries appropriate to the rights and needs of members of the command, their dependents, and other authorized personnel. The Chaplain’s Office is located in Frazier Hall (Bldg. C-7, inside Gate 2). Our telephone number is 444-7361. The duty chaplain can be reached after working hours through the Naval Station Quarterdeck at 322-2365 or at 438-3822. Counseling is done during normal working hours on a walk-in basis from 0730-1600. If you wish to see a particular chaplain, please call to make an appointment. To schedule an event such as a wedding, requests must be made no later than 30 days in advance, and must be done in person, unless deployed or stationed outside of the Norfolk area. Chapel reservations are only accepted by individuals with a DoD I.D. card. If you are requesting a sponsor honoree, the honoree must also hold a valid DoD I.D. card. Events may be scheduled up to six months in advance and can be reserved only for official or ceremonial functions.